I have talked about these products in the past, and they may have featured previously in a monthly favourite post, however I have loved wearing them so much they have slipped ever so casually in my favourite products in September! With the colder days of Autumn already in full swing, I need to make sure that my skin is fully hydrated! So lets kick this post off with a new cleanser for the collection. Kiehls Ultra Facial Cleanser, from £8.50 can be used on all skin types, and has quite a thick gelish consitency when you apply it onto your skin. You only need a pea size amount as it literally spreads a lot of product onto your skin which is really great and it feels so soft and calming when I massage it in. It removes all your makeup, even waterproof mascara and leaves your skin feeling extra smooth and doesn't leave it feeling tight and dry which is great for me! I was a little hesitant to purchasing this as it stated it was for 'all skin types' and I usually find that products that can be used on all skin types never actually fulfill what I need them to on my pesky dry skin. However the counter assistant promised it would be fine. Still slightly hesitant I purchased the travel size bottle to test it out as I hate wasting products, but I have been so pleased with this and definitly should have got the larger size! Chanel Hydramax Active Nutrition Moisturiser, £50.00 is so worth the money. 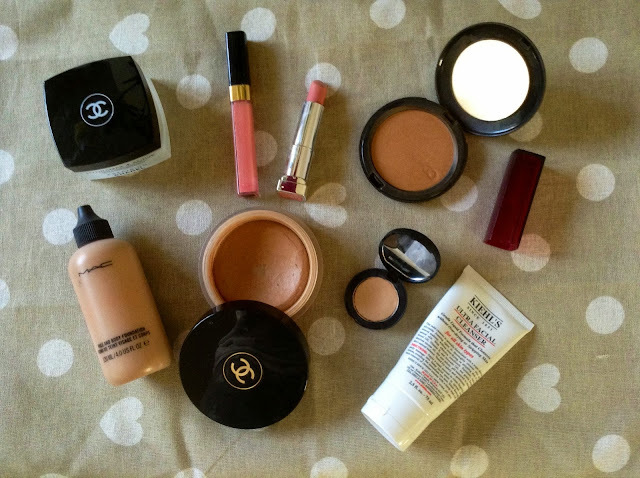 Not suprising really as I think every Chanel product I'v owned has been great value for money! I sometimes find that although moisturisers do hydrate my skin, sometimes they don't leave a nice finish on my skin to apply makeup over the top. I love this moisturiser because it is so lightweight, and a little really does go a long way. I apply this all over my face and my neck and makes my skin feel so refreshed and hydrated. It has a lovely finish, making my skin look awake, clean and fresh and provides a great base for makeup application which I love. It even helps keep my makeup on for those extra few hours, whilst keeping my face fully hydrated from morning to evening. You can't go wrong with this product! Chanel Universal Bronzing Base, £31.00 is a product I have raved about before. My favourite cream to powder bronzer ever. It can be applied all over your face and body and creates a really lovely bronze glow. In the summer I would wear this as a base without any foundation, however in the autumn, winter months I will reduce the full on application to more of a contour as lets face it, Autumn and Winter really is about strong berry lips and gorgeous smokey eyes and we don't want to over do it with a full on bronze face as well. A subtle blush with a little contour will do the trick nicely! Rimmel Pink Blush and Chanel #147 lipgloss duo was previousley raved about in my previous post which you can view here has been a staple this month. A natural yet gorgeous plumping look to your lips that won't over do it. Pair with a smokey eye for these Autumn months will give you a good reason to carry the pink look on through the year. MAC Face & Body Foundation, from £21.50 a few months back made it into the 'Not so Blushous' category, however I did state that I will make it my mission to like this foundation. Hence the reason this product has shifted from a thumbs down to a thumbs up! *everyone cheer* I think now that the seasons have changed, I am liking this foundation a little more everytime I wear it. Getting to grips with all them many different ways of applying this product (brush/fingertips/warming/patting/dabbing- you name it) I have become more accustomed to it. Warming it up and dabbing it on gives a really full coverage finish. It is long lasting, stays on all day and has a nice dewy finish. Adding a little powder will take it that one step further and keep you looking like a million dollars throughout the day! Kiko Bronzing Powder in #100, Honey Beige, £9.90 has been a product I have loved over september. Reducing down the full on face bronze to a deeper contour has been pretty darn easy with this bronze. It is not too dark to narrow it down to a contour bronze only, as over the summer it was an all rounder, but because of its buildable nature and semi matte finish, it looks great when applied underneath the cheekbone and built up for that amazing honey toned look. KikoFull Coverage Concealer in #03, £7.50 (£5.60 at the moment with 25% off) is probably the best concealer I have ever owned for it's multipurpose functionality. How often do you come across a concealer that is full coverage, gets rid of those pesky dark circles, lightens and brightens your eyes, covers up all your blemishes, red patches, sallow skin, lasts all day, doesn't crease flake OR wear off? I don't think EVER! Well I suggest you stop spending wild amounts of money on purchasing those high end concealers that you hope will do the trick because of their hefty price tag, and focus your attention to this product. I am not lying at all with the above statements! It literally does have all those properties in it! Crazy eh? and for £7.50? you can't go wrong. Take it from me, having dry skin it is really difficult to find a full coverage concealer that won't dry your skin out or end up flaking within a few hours. Even for you oily lot, there is no danger of slipping, sliding or melting off your oily patches! For heavens sake. Give this a try! Hi Alexandra - You left a question on my tutorial about the share buttons. I'm glad to see they worked for you! I did leave an answer to your question, so if you're still interested, make sure you check it out at the original link. :) Your profile isn't set to display your email address, so I couldn't email you back and had to leave a comment there.